One of the best kickers in CFL history, Medlock continued his solid work by connecting on 89.4 per cent of his field goals (42 of 47) in 17 games in 2018. He was also the only kicker in the CFL to be perfect on convert attempts (52 of 52), while leading the league with 13 punts placed inside an opponent’s 10-yard line. Medlock was a perfect 6-for-6 in a 40-32 overtime win in Ottawa in October and was 7-for-8 in the club’s two playoff games — the lone miss a 54-yard attempt in frigid conditions in the West Semi-Final win over Saskatchewan. 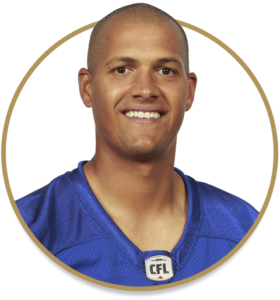 Medlock has now played in 128 career CFL games over his eight-year career, and has a career field-goal percentage of 86.5. In his three seasons with Winnipeg, Medlock has connected on 158 of 185 field goals (85.4 per cent), and has missed only one convert, hitting on 140 of 141 attempts. Led the CFL in scoring for the third straight year and second consecutive as a Bomber with 226 points… Led the CFL in converts with 48 and field goals, with 56… Connected on 56 of his 70 field-goal attempts (80 per cent), with his longest covering 57 yards… Led the league in attempts (37) and makes (22) of field goals 40 yards and longer and was six of 10 from 50 yards-plus… The average distance of his makes was 33.9 yards, second in the CFL to Hamilton’s Sergio Castillo (35.2)… Medlock hit game-winning field goals in overtime against Saskatchewan on Canada Day and in Montreal in August and connected on two field goals in the final minute of a win over Ottawa in August… Tied a Bomber record he already shared with Trevor Kennerd with a seven field-goal game against B.C. in October… Set a new career best in punting with a 43.7-yard average, with seven attempts landing inside the opponent’s 0-yard line… In his first two years as a Bomber Medlock has connected on 116 of 138 (84.1 per cent) of his field-goal attempts and is 88 of 89 in converts… Now has 1,142 career points, ranking him 19th on the CFL’s all-time scoring list. Named the CFL’s Most Outstanding Special Teams Player after a simply sensational season in which he led the CFL in scoring with a club record 227 points, becoming first Bomber to do so since Troy Westwood in 2003)… Made a CFL record 60 field goals on 68 attempts (88.2 per cent). Played two seasons for Toronto including one full campaign in 2009. Made 40-of-46 FG attempts as a first-year player but saw limited action in 2010 before being waived… Signed by Edmonton and traded to Hamilton on March 21, 2011 with Carlos Thomas for a 2nd-round draft pick… Returned to the CFL with Hamilton in 2014 after an NFL stint and played two seasons with the Tiger-Cats, connecting on 89 per cent of his field goals and being named a CFL All-Star in 2015 while leading the league in scoring with 181 points. Played for the UCLA Bruins from 2003-06… Set a school record with six field goals of 50 yards or more and was a four-year letterman… Finished his college career hitting on 70 of 80 field goal attempts, and as a senior in 2006, was a consensus First Team All-American. Selected by the Kansas City Chiefs in the fifth round (160th overall) in the 2007 NFL Draft. Also had stints with the St. Louis Rams (2008), Washington Redskins, Detroit Lions and the United Football League’s Omaha Nighthawks (all in 2010), the Carolina Panthers (2012) and Oakland Raiders (2013).